When an application goes down or IT services are delayed, your business can grind to a halt. It’s important to have a view of operational data from across all of your systems so you can identify and fix problems quickly. 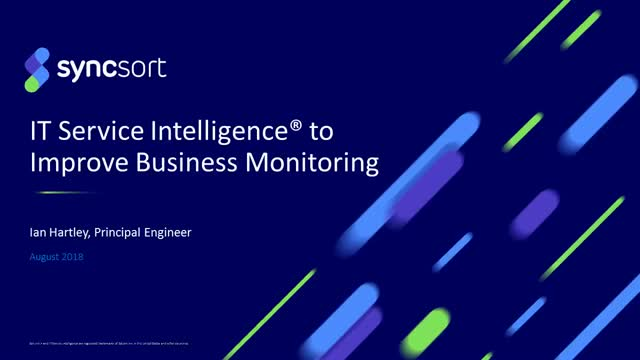 Splunk IT Service Intelligence (ITSI) is a monitoring and analytics solution that gives visibility across IT infrastructures and business services. By proactively watching streams of machine data it can detect when something starts to step out of line, and more importantly, give you time to correct problems before they have a negative impact. But in today’s enterprise IT environments, systems can span multiple technology stacks and platforms. So, what if you have a mainframe or IBM i server? Can you bring this onto the surveillance radar of ITSI? With Syncsort Ironstream® you can. Poor data quality is a primary reason why nearly half of all CRM business initiatives fail to achieve their target. Every interaction with your customers – from sales and marketing to customer service and retention – depends on easy access to both trusted and complete customer data. But how do you get in control and maintain data quality? Join us to learn how you can trust and rely on your data with an integrated data quality solution in Microsoft Dynamics 365. From the early days of IT, organizations have grappled with the challenges of understanding how well their infrastructure is performing in support of the business. They have used a plethora of tools to detect, manage, and resolve problems that are causing disruption of services, but still struggle to achieve a unified, cross-domain understanding of what is happening across their IT infrastructure. Fortunately, over the past few years analytics platforms like Splunk, Elastic, and others have emerged to address requirements around IT Operations Analytics (ITOA). Today the buzz is around AIOps – Artificial Intelligence Operations. But what is AIOps, and what can it do to help organizations address IT challenges? Die Implementierung kritischer maschineller lernbasierter Business Applikationen, von Know Your Customer (KYC) über Anti-Geldwäsche (AML) bis hin zur Betrugserkennung, ist schwierig, wenn Daten falsch, unvollständig, schlecht formatiert oder aus vielen verschiedenen Quellen stammen. Modelle des Machine Learning benötigen große Mengen an zuverlässigen, aktuellen und sauberen Daten, um ihre Arbeit zu leisten. Der Aufbau von Datenbereinigungs- und Entitätslösungsprozessen auf Big Data Plattformen wie Hadoop und Spark ist kein Kinderspiel. Wenn Modelle endlich in die Praxis umgesetzt werden, sind die Daten schnell veraltet. Wie also halten Sie die Daten in Ihrem Cluster zuverlässig mit den transaktionalen Quellsystemen in der Produktion synchron? Mainframe continues to power critical operations in enterprise IT – making it susceptible to external threats and attacks. With Syncsort Ironstream, Splunk users can easily monitor and effectively resolve application, security and network problems on the mainframe, by opening up real-time operational data in Splunk Enterprise. View this 15-minute webinar on-demand where we described the security and compliance challenges organizations face and how Ironstream® can work with Splunk to eliminate those security blindspots. Capacity management is an integral function of organizations running multi-domain complex IT environments. However, the shift over the years from physical to virtual to Cloud and DevOps/Microservices has inevitably changed the perception of capacity management and whether it is still needed. Implementing critical machine learning-based business applications, from Know Your Customer (KYC), through to Anti-money Laundering (AML) and Fraud Detection, is difficult when data originates from many different sources and geographies, is incorrect, incomplete or badly formatted. Machine Learning models need large volumes of reliable, current, clean data to do their jobs. Building data cleansing and entity resolution processes on Big Data platforms like Hadoop and Spark is no picnic – and when models get put into practice, the data quickly becomes out of date. So, how do you keep the data in your cluster reliably in sync with transactional source systems in production? Join us to find out how the key challenges of enabling Machine Learning, in even some of the toughest use cases, can be tackled with real-time data integration and data quality at scale. Fraud prevention and anti-money laundering are tough use cases to tackle. They become even more difficult when data originates from various sources, not complete or correct, or even if it’s not kept up-to-date. To make this work, machine learning models need the data in the right format, but data quality processes at Hadoop cluster scale are not easy – and the moment that models gets put into practice, the data will be out of date. So, you’ll need a way to keep the cluster in sync with transactional source systems in real-time – which shouldn’t be too hard, right? In a time when machine learning determines whether an individual receives a loan or job offer, and artificial intelligence decides who gets served ads for certain houses, failing to properly govern data can result in unintended discrimination. Using people’s personal information in ways they would never permit otherwise, has deep ethical ramifications. View this webinar on-demand to learn more about how to govern your data in the age of new regulations like GDPR. When you pull in data from different sources across the enterprise, chances are that you have information about the same person, company, product, or other entity in multiple records. So you need to find all the records that relate and combine them. Sounds simple, but names are frequently misspelled or simply entered incorrectly, and you may have to compare each individual record to every other record in the dataset with some very sophisticated matching algorithms to determine who is who – and you may have to compare the data multiple times in multiple ways to resolve each entity. With large volumes of records in the data lake you may have to compare a million to a million (or 100 million to 100 million)! This kind of compute intensive comparison can bring even a powerful cluster to its knees, trying to code from scratch is nigh impossible, and some have resorted to starting a whole new ML project just to get entities resolved for other ML projects! Don’t go down the recursive ML rabbit hole. View this 15-minute webcast on-demand to find out how you can successfully tackle these challenges. When Syncsort bought Trillium, the industry leader in data quality software for over a decade, we combined Trillium Quality with Intelligent Execution, our artificially intelligent dynamic optimizer that provides excellent performance on MapReduce or Spark. Rather than coding everything from scratch and reinventing the data quality wheel, view this short webinar to learn how you can feed production machine learning models with shiny clean data while spending zero time on coding and performance tuning. These fifteen minutes could save you weeks. Aktuelle Daten sind die beste Grundlage für die richtigen Entscheidungen. Change Data Capture oder CDC bezeichnet die Praxis, Veränderungen in einem wichtigen Transaktionssystem in andere Systeme zu übertragen. Dadurch bleiben die Daten im gesamten Unternehmen stets aktuell und konsistent. CDC sorgt dafür, dass Ihre Reporting- und Analytics-Anwendungen immer auf dem neuesten und genauesten Stand sind. Es gibt eine Vielzahl von CDC-Ansätzen und jeder Ansatz hat Vor- und Nachteile. Einige belasten die Datenquelle auf übermäßige Art und Weise. Sie sorgen dafür, dass Abfragen oder Applikationen langsam werden oder sogar abstürzen. Einige beeinträchtigen die Netzwerkbandbreite oder verursachen große Verzögerungen zwischen Änderung und Replikation. Außerdem hat jeder Geschäftsprozess unterschiedliche Anforderungen. Für einige Geschäftsanforderungen ist eine Verzögerung von mehr als einer Sekunde bei der Datenreplikation einfach zu lang. Für andere wiederum ist eine Replikation innerhalb von 24 Stunden hervorragend. Mit DMX-CDC bieten wir Ihnen die Lösung, um Ihre Daten punktgenau auf dem neuesten Stand zu halten – mit der Frische-Garantie von Syncsort! Die Hauptursache für das Scheitern von über der Hälfte aller CRM Initiativen in Unternehmen ist schlechte Datenqualität. Jeder Kontakt mit Ihren Kunden – von Vertrieb und Marketing bis hin zu Kundenservice und -Erhaltung – hängt davon ab, wie gut der Bestand zu vertrauenswürdigen und kompletten Kundendaten ist. Aber wie übernehmen sie die Kontrolle und behalten die Datenqualität? Nehmen Sie an unserem Webcast teil und erfahren so, wie Sie auf Ihre Daten, mit Hilfe einer integrierten Datenqualitätslösung in Microsoft Dynamics 365, vertrauen können. Implementing or maturing a Capacity Management process takes executive buy-in, proper planning and the tools to make it possible – plus it helps when you get to enjoy a significant return on investment from the process! Athene™, Syncsort’s market-leading cross-platform Capacity Management solution helps you to ensure continuity and optimal performance of critical business services and reduce costs. View this webcast to get a first-hand look into the features of Athene™ and how they can help enhance and further automate your Capacity Management process. How do you keep all your databases in sync and provide access to information across the business, when and where it’s needed in real-time? In this short webinar and demo, we’ll be looking at the easy way to automate data sharing for queries, reports, business intelligence, data warehousing and data lakes using Syncsort’s MIMIX Share solution. MIMIX Share captures data changes in real-time, replicates them between different databases and ensures data integrity. As an example, we’ll be demonstrating how data can be replicated between Microsoft SQL, Oracle and Kafka. - Connecting different databases in your organization with just a couple of mouse clicks. At Syncsort, we organize data everywhere, to keep the world working. We use our experience so you can quickly extract value from your critical data anytime, anywhere. Our software is used by leading enterprises - on premise and in the cloud - to optimize their data infrastructure, assure the availability and security of critical data, and seamlessly integrate their systems and improve data quality.